I thought I might write something about the recent paper by Drew Shindell, called Inhomogeneous forcing and transient climate sensitivity. The basic idea of the paper is to understand how an estimate of the transient climate sensitivity is influenced by inhomogeneous forcings. The basic result of the paper is that the surface of the Earth is not the same in both hemispheres and the excess of land in the northern hemisphere (NH) extratropics (latitudes above 28 degrees North) means that this region has a greater temperature sensitivity to changes in forcing than other regions. Another result of the paper is that the aerosol, ozone, and land-use forcings are not uniformly distributed. In fact, they have a larger effect (negative) in the NH extratropics than elsewhere. This means that the global temperature response to a net change in global forcing is smaller than it would be were the aerosol, ozone and land-use forcings uniformly distributed. This is probably best illustrated in this figure from the paper. It shows the global mean temperature change due to anthropogenic forcings when the aerosols, ozone and land-use forcings are uniformly distributed (dashed line) and when they’re inhomogeneous (solid line). The main point is that, globally, the change in forcing is the same, but the temperature response is different. However, as time progresses, the difference gets smaller because we expect the influence of aerosols and ozone to reduce with time. So, this inhomogeneity can change the temperature response during the course of the evolution of the anthropogenic forcing, but doesn’t particularly influence the transient climate response (TCR), because as we approach the point at which CO2 has doubled, the influence of this inhomogeneity gets smaller. where ΔT is the observed change in temperature (0.68o averaged over 1990 – 2009 relative to 1860 – 1879), F2x is the change in forcing due to a doubling of CO2 (3.7 Wm-2), ΔF is the change in forcing due to anthropogenic GHG emissions (2.47 Wm-2), and ΔFa+ΔFoz+ΔFLU are the forcings due to aerosols, ozone and land-use (-0.64 Wm-2). In the estimate of the latter forcings, Shindell (2014) reduced ΔFa from -1.2 Wm-2 to -0.9Wm-2 to be more to be consistent with the AR5 best estimate. In the above equation E is some factor that takes into consideration inhomogeneities in the aerosol, ozone and land-use forcings. If E = 1, then they’re assumed to be uniform. If we assume E=1 and solve the equation using the numbers above, then we get TCR = 1.37oC which is consistent with the estimates from Otto et al. (2013) which assumed that these forcings were uniform. The Shindell (2014) analysis, however, suggests that they aren’t uniform, and – to compensate – should use E=1.53, which gives TCR=1.7oC. So, the main point of the paper is simply to point out that inhomogeneities in the distribution of aerosol, ozone and land-use forcings can result in energy budgets estimates (which use the instrumental record) under-estimating the TCR. I’ve ignored uncertainties in the forcings, but that doesn’t change the basic picture. The extensive adjustments made by Shindell to the data he uses are a source of concern. One of those adjustments is to add +0.3 W/m² to the figures used for model aerosol forcing to bring the estimated model aerosol forcing into line with the AR5 best estimate of -0.9 W/m². What’s wrong with this? He was simply adjusting the aerosol forcing to be consistent with the AR5 best estimate. Furthermore, this adjustment was only applied to Nic Lewis’s favoured energy budget method. If Shindell (2014) hadn’t made this adjustment the energy budget estimate for the TCR using uniform forcings would have been even higher. Well, yes, this is partly what the paper is trying to illustrate. The estimates in Shindell (2014) that Nic Lewis is commenting on here are estimates done using the energy budget method that Nic Lewis claims is the most robust and reliable of all methods. And yet, Nic Lewis has just claimed that the large uncertainty in aerosol forcing makes estimates using this method worthless. Does he realise that he’s just said this? If anything, most others think this is a bit extreme. The general view, as I see it, is that the energy budget method may be useful for estimating the TCR and for decadal predictions, but is likely worthless for estimating the ECS. I would note (without criticising it) that Drew Shindell is arguing against the findings of the Otto et al (2013) study,[ii] of which he and myself were two of the authors. Indeed, it should be without criticism. Arguing against the findings of a paper on which you are an author is an entirely reasonable thing to do, especially if your more recent work highlights an issue with the earlier work. In fact, the main issue I have with Nic Lewis is that he seems completely unwilling to consider issues with his own papers. In a sense this is what Shindell (2014) was trying to illustrate. Energy budget estimates are unreliable because of the large unertainty in aerosol forcing and because it’s tricky to compensate for inhomogeneities in the forcings. I’m don’t think they’re worthless, but they certainly have issues that mean one should be careful in how such estimates are interpreted. Does Nic Lewis really know what he’s saying? Did he actually read the paper? So, in my view the Shindell (2014) paper illustrates something interesting about how inhomogeneities in forcings can result in different temperature responses for the same change in global forcing and hence make energy budget estimates unreliable (unless this is compensated for). Nic Lewis, in his criticism, appears to agree with this, but it’s not clear that he actually realises that he’s done so. Interesting nonetheless. Accordingly, LGM and earlier paleoclimate studies cannot reliably estimate ECS, one of the points made both in AR5 and in the Lewis & Crok report. That hasn’t prevented the folk at SKS attacking us for saying so, and claiming that paleo studies support an equilibrium climate sensitivity between about 2 and 4.5°C. So a criticism by SkS folk is an attack, while Nic Lewis’s critique of the Shindell paper is just strong criticism? Having read them both, it seems Nic Lewis has rather an odd way of distinguishing between an attack and a strong criticism. This entry was posted in Climate change, Climate sensitivity, Global warming, IPCC, Satire, Science and tagged Climate sensitivity, Drew Shindell, ECS, Energy budget estimates, GCMs, Nic Lewis, TCR. Bookmark the permalink. I saw something ages ago, but not recently – although I did read that they’d made another appearance recently. I’ll have a look when I get a chance. In fact, the main issue I have with Nic Lewis is that he seems completely unwilling to consider issues with his own papers. That is certainly the impression I got from reading his post at CA. I, for one, am moving closer to the conclusion that Lewis is not acting in good faith. Yes, they had some stuff a year ago or so. This is, I think, their final report with a Feb 2014 date. Since the heat content of the oceans is vastly greater than that of the atmosphere, and the oceans account for 70% or so of the Earth’s surface, more in the tropics, why would land temperatures be more appropriate than ocean temperatures? A paper by Stephen Schwartz of Brookhaven Laboratory examined the data for the oceans and got a low value for sensitivity in the range of the low value. 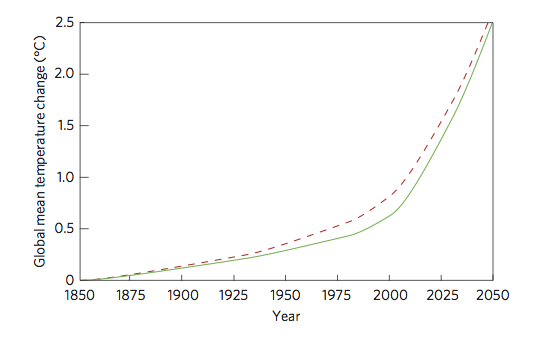 For doubling of CO2 he estimated 1.1 ± 0.5 K.
Heat capacity, time constant, and sensitivity of Earth’s climate system. Schwartz S. E. J.
why would land temperatures be more appropriate than ocean temperatures? Depends what you’re asking. TCR is defined as the increase in surface after a change in forcing due to a doubling of CO2 (formally increasing at 1% per year). The high ocean heat capacity means that the land responds more to a change in forcing than the oceans do to the same change in forcing. Therefore, if the change in forcing across the globe were the same everywhere, the NH extratropics would warm more than the rest. However, if the aerosol, ozone and land-use forcings are also focused in the extra tropics, then that has a bigger impact on the surface temperature change (due to a change in forcing) than if these forcings were uniformly distributed. That’s really what the Shindell paper was illustrating (as I understand it at least). Chris, that paper of Schwartz was shot down, and shot down hard. It was one of those “out of your depth” papers that I think all scientists will experience at some time. It was just odd it managed to get through in that journal. Just so you have the pdf’s available without having to be in a university library. as he goes up to 1.9 plusminus 1, rather than 1.1 plusminus 0.5, when taking into some of the criticisms. He still does ignore a few issues, though. Wow, nice catch on Lewis saying I ‘attacked’ his report (by pointing out its flaws and saying it was biased) while his criticisms of Shindell are just ‘strong criticism’. Sheesh. OPatrick wonders if Lewis is acting in good faith. That depends on how you define the term. Like most contrarians, I don’t doubt he believes what he says, but his perception is clearly influenced by his biases. He wants climate sensitivity to be low, so he looks for evidence that it’s low, and finds ways to reject evidence that it’s moderate or high. I don’t think this is a conscious bias, I think it’s subconscious. In which case I’d argue he’s acting in good faith, but his conclusions are wrong and shouldn’t be blindly trusted (which of course is exactly what his fellow contrarians will do – blindly trust the results they like). Can’t access the main paper, so only the SI to go on. Looks a bit of a mess trying to combine forcing estimates from different methods (regression versus fixedSST) and in some cases different models in order to derive TCR from linear formulae. The 1%/yr 2xCO2 TCR used for a couple of models doesn’t match figures elsewhere. HadGEM2-ES is reported in AR5 as 2.5ºC, whereas here it is 2.1ºC. Using the more accepted number changes the TCR enhancement factor from 1.48 to 1.24. Despite these issues there is still an apparent correlation, though the small sample size, and uncertainties related to how forcing factors are combined, means it would be difficult to argue against the idea that it may be spurious. Of course idiots will continue to play the “down the up escalator” game indefinitely, but I don’t feel the need to play with them. I’m usually happy to let the “communicators” duke it out on the most politically correct way to present the science, but perhaps they could start by not using a term that’s factually wrong. On a more general point there are a number of reasons to believe a representative TCR for future warming will be different from a diagnosed TCR for historical warming. Just to name one that hasn’t been mentioned either at Ed Hawkins’ blog or here, there is potentially a difference between historical WMGHG forcing, which is about 60% CO2, compared to future WMGHG forcing where the proportion due to CO2 is much higher. There are biogeochemical responses to CO2, not triggered by other WMGHG, which can affect feedbacks, e.g. Andrews et al. 2012. The response to WMGHG indicates that the transient sensitivity of the NH is ∼60% greater than that of the SH (Fig. 2). Hence, if all of the aerosol + ozone forcing was in the NH, and the response was relatively localized in latitude, one would expect roughly 30% greater global mean temperature response than for uniform forcing. In these CMIP5 models, 77% of the net aerosol + ozone forcing is in the NH, and 82% of the extratropical forcing is in the NHext, implying that indeed the spatial asymmetry can account for a substantial portion of the enhancement found here. The first part of this makes sense. There’s more land in the NH than the SH and so the NH warms more due to a change in forcing than the SH. It’s the next bit that confuses me. If all the aerosol+ozone forcing was in NH (and hence the forcing is double what it would be if it were uniform) then that should suppress temperatures in the region that has the largest response. Therefore, I would have expected a larger temperature response if the aerosol + ozone forcing was uniform rather than all localized in the NH. The paper later describes it exactly like this, so I think my basic understanding is correct, but the description of the models is very confusing and there is something I’m still missing. I didn’t ask Forster and Gregory to comment on my analysis in advance. I thought that would put them in a difficult position, as they were Contributing authors for chapter 9 of AR4:WG1 and, presumably, accepted (at least tacitly) the IPCC’s [alteration] of their results. I will also note that w/r/t his comment I excerpted above, I find his claim of not wanting to put the authors in question “in a difficult position” to be highly implausible. He published a post asserting an “alteration” of their work, and (at least tacit) acceptance on their part of that alteration of their work. Predictably, his assertions elicited claims of fraud from many of Judith’s “denizens.” I find it implausible that notifying them and asking them for comment first, before publicly asserting they at least tacitly accepted the misuse of their work, would have made their situation more difficult than the situation created by his course of action. In the very least, that is not a particularly good way to lay the ground work for a good faith exchange of scientific disagreement. It’s one thing to assert technical errors in someone else’s work, It’s another thing entirely to assert that scientists are deliberately misleading (or accepting of others deliberately altering their work) – particularly if you have no actual evidence of intent. When , “lukewarmers” claim that they’re all about the science, and assert that they’ve elevated themselves above the rhetorical and tribalistic battles, they undermine their credibility when they engage in same ol’ same ol’. Okay, I may have finally worked out the modelling aspect of the paper. The TCRs in the SI are transient responses to WMGHG, aerosols+ozone+LU, and the aerosols+ozone. What was confusing me was that the aerosol+ozone+LU TCR exceeded the WMGHG TCR, but it’s really just the change in T due to those different changes in forcings. So, in the case of aerosols+ozone+LU, it’s actually a drop in temperature and the reason it exceeds the TCR for WMGHG is because it’s inhomogeneous (more in NHext than elsewhere). The ratio between these two TCRs can then be used to estimate how the inhomogeneity can influence the actual TCR given that the inhomogeneity is present today, but will not be present (or not as significant) in the future. Seems obvious now and maybe it was obvious to everyone else. Took me a while though. My impression of Lewis was reasonably positive after the Parliamentary enquiry that he presented evidence at – at least, in the sense that he appeared to be acting in good faith. It is less so after encountering him on Ed Hawkins’s blog. His performance at JC’s after his attack on the Met Office was damning. Yes, I’d rather forgotten about that. It’s like Lawson, who also knows he’s right, just as he also knows the IPCC is politicised and pushing bad science. The truth becomes plastic around these certainties – it bends to fit what these gentlemen know. Re Nic Lewis’ attitude: Aerosols are the one thing he likes the least (which is why he refuses to accept AR5’s best estimate). So do most “Lukewarmers”. For them, aerosols doesn’t even seem to exist (well, black carbon does). Mainstream science is just using it as an excuse to make things look consistent. Unfortunately, (solar) dimming and brightening is something we have actually measured. Inflating the uncertainty undermines ALL of his work as much as it undermines Drew’s work. Perhaps he thinks that dropping the inconvenient fact that aerosol forcing is strictly different in both hemispheres could somehow (magically) reduce the uncertainty, but that’s of course not the case. You just can’t make the physics go away, as much as you are tempted as a trained statistician. Inflating the uncertainty undermines ALL of his work as much as it undermines Drew’s work. No, ATTP, you still don’t see. Lewis knows he is right. So there is no contradiction here; no illogicality. I thought the HadGEM2 TCR change would be something like that but don’t understand why that step was taken. Those TCR figures weren’t calculated from a formula – they’re the GAT increase after 70 years, the literal definition of TCR. It makes no difference how the forcing is diagnosed. Am I missing something? See 1998 GCSCT action plan, from an interesting group, hosted by the American Petroleum Institute. the goto folks have been Sallie Baliunas and Willie Soon, Steve McIntyre and Ross McKitrick, Ed Wegman, recently Murry Salby., as a small sample. ok, it’s only now that I follow the logic behind your numbers. Hadn’t really thought through before. What Drew did is to change both, F_2xCO2 and F_GHGhist, to fixed SST forcing (from the regressed forcing). As fixed SST F_GHGhist wasn’t available for HadGEM2, he adjusted it upwards (19%) according to the fixed SST F_2xCO2. The 1%/yr CO2 TCR was adjusted accordingly. I’d expect the TCR enhancement factor to be reduced less when using fixed SST F_2xCO2 and fixed SST F_GHGhist. Not sure though. Does that make some sense? Hmm, I can only see the abstract of this paper, but it looks as if Nic’s week may have just gotten even worse. Well, I’ve been saying from the outset that Lewis has been cherry-picking to get a desired but fundamentally uninformative result. It’s nice to see this Santer johnny-come-lately chappie catching on. But we’ll not see an end to the crafted nonsense any time soon. In fact the quality of misleading analysis has actually gone up recently, mainly thanks to the efforts of NL. Although there are others. Just gonna throw this in from the Guardian – a good list of the range of modern lobbying tactics. Note especially the various astroturf / “buy in credibility” / “sponsor a thinktank” points. Re. the GWPF (and Nic Lewis’ connection to it), we don’t know what we’re dealing with because it’s not transparent. But it’s purpose is, really, pretty transparent. So what kind of climate scientist would choose to publish there? And should they be humoured? I can sort of follow the logic there, it’s not a big factor anyway. I think it (the whole practice of combining different forcing estimates produced using different methods then adjusting here and there to compensate for things) just seems a bit convoluted to me. There must be a better way to demonstrate the effect. Regarding the specific interpretation and its applicability to real world observations, AIUI Drew Shindell is suggesting that aerosol forcing tends to be focused over the NH Extratropics in models and this leads to greater transient cooling in aerosol-only conditions due to the large fraction of land in the latitudinal zone. When combined with WMGHGs in the HistoricalAll simulations the suggested effect is presumably that these NH Ext land areas warm disproportionately slowly due to local aerosol forcing. Indeed this appears to be the case in most model runs with large NH Ext aerosol forcing. The conclusion is then that we should expect future warming to be faster – have a larger TCR – as aerosol forcing is reduced through the 21st Century allowing the NH Ext to warm faster. Actually, Figure 8 in Nic Lewis’ GWPF publication shows a similar result for GFDL-CM3 and HadGEM2-ES – much greater 21st Century TCR compared to 20th Century. 1) Observations for NH Ext land surface temperature show no sign of disproportionately slowed warming. In those models with large NH Ext aerosol forcing the warming ratio for NH Ext land (30-65ºN) vs. “global” land+ocean average (60ºS-60ºN, clipped for compatibility with observational sampling) comes to about 1.2-1.4, whereas observations indicate a ratio of about 2. 2) Aerosol-cloud interaction findings from observations. It’s often stated that data from satellite observations suggests aerosol-cloud interaction is weaker than models generally produce. However, it’s also the case that this discrepancy has regional structure and the largest overestimates in models tend to occur over NH Extratropical land regions, particularly Asia. See supplement for Quaas et al. 2009. Neither of these is necessarily fatal. Internal variability can perhaps explain enhanced Extratropical warming, or perhaps models generally tend not to shift energy Northwards quick enough. Satellite data used to analyse aerosol-cloud interaction could be mistaken or misinterpreted, and even with a proportional reduction NH Ext aerosol forcing will still be quite large. Nevertheless, given what we can actually see at the moment the most likely interpretation for me is that the NH Ext forcing hypothesis tabled by Drew Shindell doesn’t fit comfortably with observations. I’ll provide an alternative scenario, informed by the MRI-CGCM3 model, which is not affected by the above challenges while still suggesting possible greater future TCR for different reasons, though perhaps also related to aerosol forcing. This model has a moderate 2xCO2 TCR of 1.6ºC and ECS 2.6ºC, according to the method of Andrews et al. 2012. Global average aerosol forcing is also apparently moderate at about -1W/m2 as of 2000. The spatial distribution of this aerosol forcing is very different from other models, focused mainly on the Tropics rather than NH Ext. Despite the small NH Ext aerosol forcing the HistoricalAll simulations produce only about 0.6ºC warming since 1850, 75% of the observed increase. If you were to linearly scale TCR to make the model match observed warming it would require a value of 2.1ºC. Under the RCP85 scenario MRI-CGCM3 in 2100 is about 3.5ºC warmer than present. From the abstract I’d say that’s more immediately relevant to papers like Fasullo and Trenberth 2012 and Sherwood et al. 2014 than energy balance type estimates. Probably affects D&A scaling approaches though, and possibly some of the recent LGM-based estimates. possibly some of the recent LGM-based estimates. Eg. Hargreaves et al. (2012)? Yes, possibly. As it says in the abstract the estimate is based on them finding a statistic which seems to correlate with model sensitivity. Of course, the fact that some correlations turn out to be spurious doesn’t mean all are. There aren’t enough places where you can sit quietly and listen and learn. I’m sorry – I meant to finish by asking which paleo estimates you had in mind? Some very interesting stuff on SoD. I still don’t quite know what to make of the Milankovitch issue that SoD highlights. I think he’s quite right to do so, but I would still be surprised if there wasn’t some orbital forcing influence. Having said that, it does appear that there still isn’t a well-accepted trigger for the changes. It was Hargreaves et al. that immediately came to my mind. There is another paper headed by Gavin Schmidt, possibly as yet unpublished (? ), which uses the same/similar methodology on newer PMIP3 models. Schmittner et al. 2011 also crossed my mind, that was about pattern matching in relation to different sensitivity parameters in a simple model – not exactly what the Caldwell paper is addressing but arguably it effectively works along similar lines. It’s worth noting it wouldn’t be news to Jules and James to state a possibility that the correlation might not be “real”. The abstract is pretty clear about caveats in this regard. Only the top part of the tl;dr comment was addressed specifically for Karsten. The rest was intended as a general comment on the topic of the thread, was hoping the line would show the separation. I should probably have started a new comment instead. SoD has never written that there were not some orbital forcing influence. Actually he has written many times that effects of the obliquity cycles (about 41000 years) and precession cycles (roughly 20000 years) are well confirmed. What’s questionable is the role of the eccentricity cycle of around 100000 years. As SoD has demonstrated, scientists who study glacial cycles have many different ideas on the connection between the eccentricity cycle and the glacial cycle. It appears very likely that orbital effects influence the length of the glacial cycle, but what’s the most important factor that affects the length of the glacial cycle is far less clear. Theories that try to explain that by internal dynamics of the Earth system appear promising, but nothing has been confirmed. Yes, true. It is the 100k year eccentricity cycle that he was discussing. As I am sure you know, the lower estimates from LGM/Holocene transition may be influenced by a possible under-estimate of LGM SSTs, particularly tropical SSTs (eg MARGO). for me, SoD is mainly a place to sit quietly and listen and learn. Very interesting, and humbling in that it teaches me just how little I know. Pekka and Anders, did you read my comments on the latest post there and SoD’s responses? At this point the mystery seems largely solved, although there seems to still be some dispute as to what factor changed to allow the longer post-MPT cycles to begin with. As far as I can gather the field still leans heavily toward CO2, although so far there doesn’t seem to be (I can’t find, anyway) an answer to the objection that interglacial levels don’t seem to have dropped. “Theories that try to explain that by internal dynamics of the Earth system appear promising(. )” Not so much any more, but the evolution of the SoD discussion makes it clear that one needs to first have some pretty good confidence that all possible alternatives have been exhausted before resorting to such explanations. ‘ware the stadium wave. Although re those ideas, a rather large hump they would have to get over is explaining why the post-MPT cycles are so consistent, which would in turn seem to require some memory across the interglacials. It’s hard to imagine what that might be. What strikes me as interesting is that you get ~41ka obliquity deglaciations pre-MPT and deglaciations at 2x and 3x multiples of the obliquity cycle thereafter. Given the general Pliocene Pleistocene cooling trend, it’s not hard to envisage conditions permitting NH ice sheets to recede less and less during high obliquity until a threshold is crossed at he MPT and the long interglacial cycle emerges. I was reading your comments, but I shall have to go through them again as it is getting late and I’m not quite taking it all in. This is an area that has been studied for long. I’m sure that some explanations have been considered convincing at some time, just to be later countered by new arguments strong enough to shatter that temporary confidence. My expectation is that the same will continue still in the future, not indefinitely, but for years, and possible a couple of decades. I like the recent paper of Abe-Ouchi, because the picture painted there fits so well with my intuition, but that’s of course an irrelevant argument on the level of science. Explanations that appear natural from the data are easily adopted by many, but that appearance of the data may be misleading. Therefore I expect that it will still require many new ideas, some more data, and better models before it’s time to say that a very likely solution is known. Pekka, obviously I’m no expert, so I base my assessment on 1) whether the hypothesis has any loose strings (this one doesn’t) and 2) what others in the field think. In that latter regard, since it’s perhaps still too early to expect opposing papers, I have dredged through the conference abstracts (including EGU 2014 as of yesterday) but found nothing, notwithstanding that this issue has a lengthy history of some pretty strong contention. And as SoD pointed out, Abe-Ouchi’s basic idea isn’t all that new (albeit not really fleshed out all the way until recently), so there’s been plenty of time for some very smart people (Peter Huybers e.g.) to find something wrong with it. I should add that it’s precisely because this solution didn’t seem natural from the data that it took so long to find. Anybody here going to EGU 2014, BTW? I think that these ideas are still on the stage, where they are not obviously contradicted by anything known, but very far from the level, where a uniquely fixed model predicts (or truly backcasts) the observed history. The ideas have survived early tests, but I’m sure that looking at the history in more detail will reveal issues that must be resolved to better confirm the ideas. I’ve just read your comments at SoD. NH Ice sheet extent always seemed an obvious threshold to me, but like you, I am not an expert. I can’t even find the references for studies that suggest that repeated glacial erosion of topsoil pre-MPT allowed the NH ice sheets, especially the Laurentide, to become more fast to the bedrock and so more resilient to obliquity forcing. Pekka, Abe-Ouchi’s hypothesis can’t backcast in that way since it’s missing the initiating signal for the MPT. But otherwise there’s not much point in arguing about this further in this venue. That was linked there, BBD, although I seem to recall there being an awful lot of links. 🙂 Here it is. IIRC the proposed mechanism is a CO2 drop via increased weathering of exposed regolith, not increased stickiness. One reason that added to my willingness to write those comments is that I consider it really important to be skeptical on every new scientific results, and in particular of those you like. A really large share of new results turns out to be at least somewhat wrong or exaggerated. A good scientist is always skeptical also on own findings. Most scientific problems are difficult. Therefore erring is natural. James Annan made a similar comment in discussing the Shindell paper in his blog. Well confirmed science is a very different thing. There errors are rare. Sure, Pekka, I can only agree with that principle. Actually I should add that the Pleistocene glaciations are not in my usual focus, which is broadly speaking earth system responses to increased CO2, but that post caught my eye since in it SoD seemed to have not even read the paper I had the impression (correct, it turns out) was the key one in the field because he was dismissive of a couple of preliminary nods to prior literature that weren’t even part of the analysis, and instead was enthusiastic about going off on some harmonic oscillation wild goose chase! Sorry, I should have said earth system responses with relevant to the next several centuries. thanks for your thoughts. I’m with you in most points. Regarding your first challenge, I offer a slightly different view, informed by this well known (given that I posted it here at least twice) figure. I deliberately go for the simpleton approach, i.e. I treat (1) the observed AMOC changes as amplified response to the aerosol forcing, (2) aerosols as represented by sulphates only, and (3) ignoring volcanoes (which,admittedly, isn’t a particularly good idea for the first half of the 20th century). 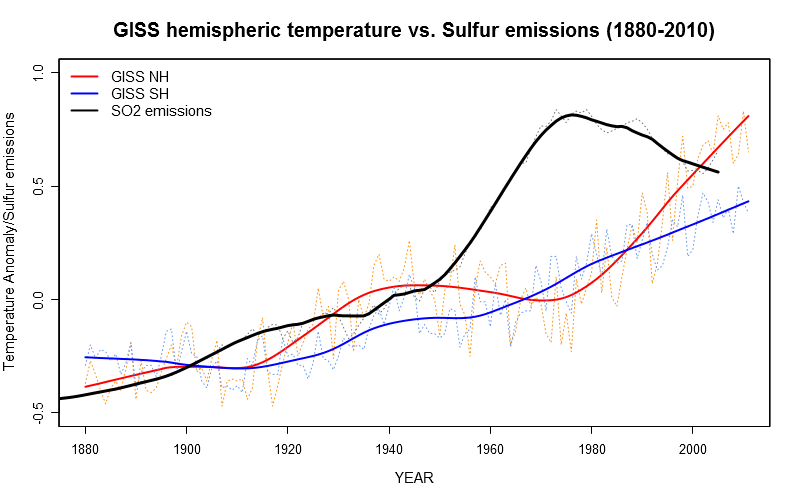 In doing so, I have reason to think that the must faster NH warming since 1975 is indeed caused by the superposition of reduced (negative) sulphate forcing + WMGHG forcing. Combined with the higher NH Ext-TCR, surface temperatures went up by a staggering 0.8K in 35 years (AR5 WMGHG forcing in the order of +1.5 W/m2). In contrast, sulphate forcing overwhelmed the WMGHG forcing between 1940-1975 (which is in the order of +0.7 W/m2 during that period of time). Say we have a sulphate forcing of -0.8 W/m2 (already starting at fairly high sulphate concentrations in the 1940s). Everything between 1.2 – 1.5 seems plausible as TCR enhancement factor from these simple considerations. I’d love to do some more sophisticated number crunching, but at the moment too many other things are waiting to be done. Regarding your second challenge, Asia is indeed sort of undermining my analysis. So I’d have to add Black Carbon to find a way out of the misery (which is that China has warmed pretty fast as well; plus southern China seems to be influenced by ENSO). But then, we’d have to ask where the additional aerosol cooling might have an impact today. The equatorial regions are certainly a hot candidate, keeping also in mind that emission inventories for Africa tend to underestimate anthropogenic emissions systematically (confirmed by the fact that global AOD hasn’t gone down). Yet a trend towards more BC should have helped to warm the entire NH more than many people believe. The NAO+ phase in the 1990s adds to that, but if you strongly change regional forcing patterns within a short period of time (Clean Air Act/Collapse of Eastern economies), how on Earth could the North Atlantic (or the AMOC for that matter) not respond? Anyways, speaking of the tropics, your MRI model example makes sense to me. ATTP:My impression of Lewis was reasonably positive after the Parliamentary enquiry that he presented evidence at – at least, in the sense that he appeared to be acting in good faith. It is less so after encountering him on Ed Hawkins’s blog. In my opinion, making insinuations about other people’s motives always undermines one’s own credibility. People can get “animated” and say things in a bit more strong terms than they mean at times, without us having to decide they aren’t acting in good faith. But really, you’re doing basically the same thing you’re objecting to him doing when you resort to this, only perhaps you’re being even more base. Maybe we should revisit the part of my comment that you’ve quoted : My impression – my opinion in other words – was reasonably positive after the parliamentary enquiry – I thought he did okay – it is less so after encountering him on Ed Hawkins’s blog – I encountered him on Ed Hawkins’s blog and my opinion is less positive after doing so. I’m not really insinuating anything. I’m simply expressing an opinion. Maybe you should reread your comment with your irony filter turned on. If Nic Lewis cares about whether or not people think he is genuinely interested in actual scientific discussions he could try to not only respond with nitpicks and he could try to avoid ending almost all his responses with the conclusion that the other person is completely wrong and, by inference, that Nic Lewis is therefore completely correct. Of course he could do what he is quite entitled to do which is to not care what others’ opinions are. They are, however, still entitled to hold them and, if they wish, to express them. Libertarian tolerance for the misbehavior of other libertarians in an interesting phenomenon. They have to put up with each other’s foibles, Steve. There aren’t enough able-brained pseudosceptics peddling unfeasibly low sensitivity estimates for people to get picky. Steve Bloom, I suppose that snark was aimed at me. I’m actually not a libertarian, not even close. So another one of your mind reading fails. I do think that government has a role to play here and in many other arenas. I support the ACA, for example, though I think the HHS policies associated with it need more work. I aksi don’t like it when McIntyre makes his snide remarks, I’ve said my piece to him, though with predictable null results. I think going off about the use of the word “attack” is just silly though. I thought Nic was overly strong in his ClimateAudit post in his word choice and I thought that undercut whatever positive he had to say. And I think ATTP can make his point here without dawdling over the meaning of the word “attacked”. It’s a fine word, aptly descriptive of both Lewis’s commentary on Shindell’s paper and of Dana Nucitelli’s commentary on Lewis’s manuscript. BBD, I suppose that was aimed at me too. Can’t you guys just be honest? Simply because I object to the way ATTP framed his comment shouldn’t be seen as an endorsement of what I view as a low-ball result from Lewis. If I’m talking about the plain-English parsing of your attempt to communicate, that isn’t a question of whether you are acting in bad faith, it’s a question of whether you communicated what you intended to communicate. There no irony in noting that suggesting that your words, which apparently suggest that somebody acted in bad faith, acted in bad faith. I will take you at your word you didn’t mean to imply that you thought Lewis was acting in bad faith. But I think you should also be able to admit the insinuation of bad faith is a fair reading of what you actually wrote. “If I’m talking about the plain-English parsing of your attempt to communicate, that isn’t a question of whether you are acting in bad faith” … it’s a question of whether you are reading in good faith. I say no. I say that’s a fairly charitable statement to make about Lewis. Okay, so I did leave that part out. The first part of that sentence was meant to be a positive. I thought what he presented in the parliamentary enquiry was okay. Not brilliant, but okay. I’m simply less impressed now that I’ve encountered him again. So, being less impressed wasn’t necessarily meant to suggest that I now think he’s acting in bad faith. As I mentioned in my response to you, his style is one that doesn’t give confidence that he’s actually interested in a serious scientific discussion. I don’t think he is particularly experienced in scientific discourse, and that – in my opinion – shows in how he engages in discussions. He’s also far too confident about his own work, in my view at least. But I think you should also be able to admit the insinuation of bad faith is a fair reading of what you actually wrote. Should I do that? I thought I had written it quite carefully. I thought he did okay at the parliamentary enquiry, but since then have become less impressed. Okay, I can see how you might interpret it as you have but I don’t really think I have to accept that your interpretation was what I intended. I do, however, agree with what I think you’re trying to say. I can’t determine someone’s intent and have no real intention of trying to do so. My comment was simply meant to be expressing an my opinion that I’m less impressed now than I was. dhogaza: it’s a question of whether you are reading in good faith. I say no. Perhaps the word is “charitably”, as in interpreting the meaning in best possible light to the author. The other implies motive again, and you’d be wrong. If somebody says “at least, in the sense that he appeared to be acting in good faith”, one really has to really be stretching it to say that a reader couldn’t legitimately think the rest of the paragraph had something to do with “acting in good faith”. andthentheresphysics: Okay, I can see how you might interpret it as you have but I don’t really think I have to accept that your interpretation was what I intended. I agree that you don’t have to accept that my interpretation is what you intended, and I don’t claim otherwise. You are the arbiter of what you meant to say. And as I said above, I accept your correction of my misinterpretation of your intent. As I pointed out to dhogaza, when one constructs a paragraph that includes “”at least, in the sense that he appeared to be acting in good faith”, it’s hard to puzzle out why the rest of the paragraph wouldn’t relate to that phrase. That’s the sense in which I meant “a fair reading”. Where is the dishonesty, Carrick? Show it. You’ve gone too far already and you’ve only been here five minutes. I mean this part “They have to put up with each other’s foibles, Steve”. But this isn’t going to far, right? Seriously one set of rules for you, another for the rest of us I guess. Are you suggesting that there is a group here who support unfeasibly high sensitivities? I was asking who is the “they” you intended, and why you can’t explicitly state it in an honest and forthright fashion. Oh for goodness’ sake Carrick. Haven’t you got something more important to do that bicker away online like this? And let’s get something straight. Nic Lewis is in bed with the organised denial machine in the UK: Lord Lawson’t political lobby group the GWPF and serial misinformer, conspiracy-theorist and one-time McIntyre publicist Andrew Montford, aka Bishop Hill. I have no time for these people and their pernicious activities. When you pop up acting as an apologist for Lewis, expect to be dealt with as a fellow-traveller with the misinformers, shills, conspiracy theorists and libertarians. I do hope that was honest and forthright enough for you, Carrick. I can be plainer still, if you wish. No, the antecedent of the pronoun “it” in “It is less so” is “My impression”. Where is the noun in “in the sense that he appeared to be acting in good faith” that the pronoun “it” refers to? I have no idea. My best guess is 2.5°C/CO2 doubling ECS (4°C/CO2 doubling at 95% CL), if that helps you frame my views. BBD, I wasn’t apologizing for Lewis’s comments or behavior. I was just trying to make a constructive comment, with predictable results. Even Montford serves a useful role, even if I mostly disagree with what he says. I think this is a good point to end this bickering, if you don’t mind. I wasn’t asking for your views. I was wondering what you meant by “one set of rules for you, another for the rest of us”. Anyway, it doesn’t really matter that much. andthentheresphysics, I’m afraid it would devolve further into a discussion on tribalism or other sociological constructs. My sincere apologies for the derailing effect my comment has had on this thread. The discussion between K.a.r.S.t.e.N and Paul S was much more interesting. I could have put that comment on the communications thread, where it would have been more appropriate.